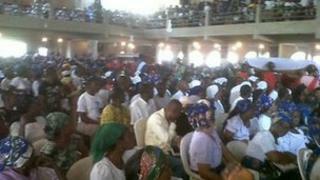 Thousands of mourners in Nigeria have attended the burial service for people killed at a church on Christmas Day. The BBC's Chris Ewokor at St Theresa Catholic Church in Madalla near the capital, Abuja, said the service sheets listed the names of 43 victims. The militant Islamist group Boko Haram said it carried out a series of attacks on 25 December 2011. Over the last year, the group which wants to establish Islamic law in Nigeria, has stepped up its activities. One of its most deadly attacks targeted police stations in the large northern city of Kano in January. Nigeria, Africa's most populous nation, is roughly evenly divided between the mainly Muslim north and Christian and animist south. In recent weeks, southerners living in the north have also become the targets of Boko Haram's attacks and thousands have fled their homes. Our reporter says the church, which seats 3,000, was packed - with many more people crowded outside. The front of the building was destroyed in the bombing on Christmas Day and temporary repairs have been done to the roof, he says. There was a heavy security presence and people were frisked before entering the church grounds, our reporter says. The man suspected of masterminding the Christmas Day bomb attacks escaped from police custody last month. The service in Madalla took place as the police announced they had arrested the Boko Haram spokesman Abul Qaqa in the group's base in the north-eastern city of Maiduguri. Over the weekend, Mr Qaqa said the group had rejected Nigerian President Goodluck Jonathan's recent call for open dialogue to end the conflict. Boko Haram, which loosely translates from the local Hausa language as "Western education is forbidden", first came to prominence in 2009 when hundreds of its followers were killed when they attacked police stations in Maiduguri. In 2010 the group started to stage drive-by shootings on government targets in revenge for his killing. Last year, it carried out suicide bombings on high-profile targets such as the headquarters of the UN and the police in Abuja.